Beau’s All Natural Brewing is following up the popularity of 2011’s coffee beer, WinterBrewed, with two new coffee and beer blends for 2012. The beers will be released for sale Feb. 16, and launch celebrations in both Ottawa and Vankleek Hill will follow on Saturday the 18th. WinterBrewed 2012 is an amber lager, brewed with Guatemalan organic fair trade coffee from Ottawa’s Bridgehead Coffee. The coffee flavours and aromas are accented and enhanced by a distinct New Zealand hop presence. 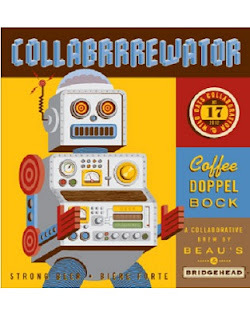 The other beer + coffee offering is Collabrrrewator, a strong (8% abv) doppelbock beer brewed with a blend of 3 flavourful organic fair-trade coffees, creating a bold coffee taste and aroma. As was the case last year, both beers are being released in conjunction with the final weekend of Winterlude celebrations in Ottawa. Bridgehead is hosting a launch event at their Sparks St. location (96 Sparks St.) on Saturday Feb. 18. From 8-10 pm, patrons can stop by and sample or purchase full glasses of both beers. The money from drinks purchased will go to support Shepherds of Good Hope (Shepherds of Good Hope has offered shelter and support services to Ottawa's homeless for the past 29 years). Live music and food round out the event, and Beau’s brewers and staff join Bridgehead folks to meet, greet and answer questions about their latest collaboration. Media and the public are invited to come by that night (perhaps after a skate on the canal) and enjoy a glass of coffee beer in the warm and cozy Bridgehead ambiance. Visitors to the brewery Saturday Feb 18 will be treated to a Winter Patio Party to celebrate WinterBrewed and Collabrrrewator as well. An outdoor fire for roasting marshmallows and s’mores will be set up, and Beau’s is organizing a 3-on-3 hockey tournament to take place that day—the winning team will be outfitted in Beau’s jerseys. Interested participants can call Dave Barton at the brewery for more information. Pascale Berthiaume of Pascale’s Ice Cream will be on hand stirring up hot chocolate made with Beau’s beer, and of course Bridgehead coffee will be available. Outdoor bar service will be available for the day, with a special cask of Collabrrrewator tapped at noon. Presales of WinterBrewed and Collabrrrewator have already begun online at www.bybo.ca. The beer will be sold direct from the brewery or online only, in 600 ml bottles for $7.85 (WinterBrewed) and $9.85 (Collabrrewator) incl. tax and deposit.